All cardstock is Pure Luxury Heavy Based by GinaK Designs. The images and sentiment are by the Sweet Stamp Shop (Happy Bugs & Pattern Craze). 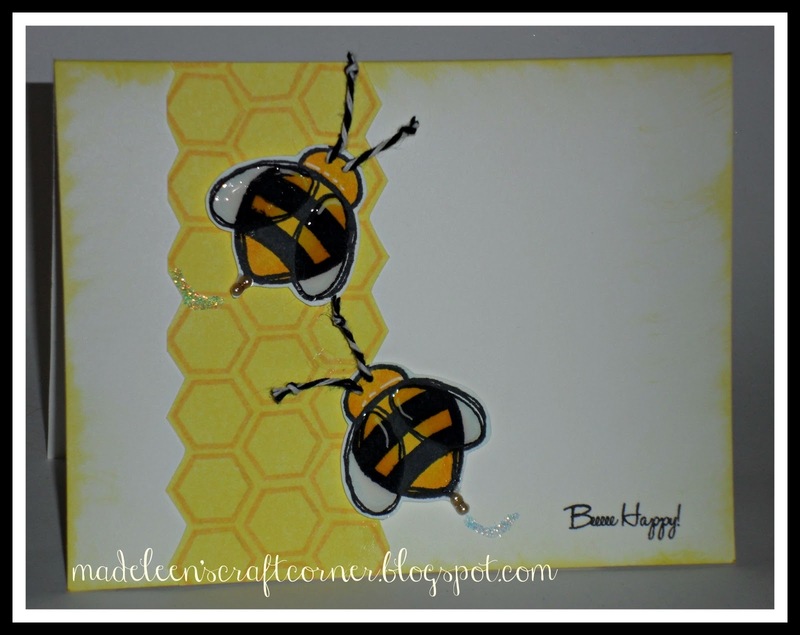 I stamped the bees using Memento Tuxedo Black, coloured them with Copic Markers and fussy cut them. I added some stickles, glossy accents and pearls and added some twine by Timeless Twine for the feelers. I stamped the honeycomb pattern using Memento Cantaloupe and sponged Tim Holtz Squeezed Lemonade distress ink over the top. I also sponged this around the edges of the card base. Thanks for visiting & remember to pop in during the week as I share more Crafty Card Gallery posts with you! It's very bright and lots of fun. I just bought Tim Holtz Squeezed Lemonade distress ink, and look forward to using it - especially after seeing your results! Sweet card Madeleen! LOVE the image and sponging on the edges. Hi Madaleen! Love the bright colours! Madeleen this card is so much fun!! I love you used twine for the feelers, brilliant! !